1 Adjust the oven rack to the middle-lower part of the oven. Preheat oven to 375°F. 5 Use a standard 12-muffin muffin pan. 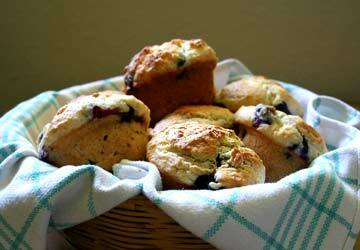 Coat each muffin cup lightly with olive oil or grapeseed oil using a pastry brush, or with a little butter. Or use one of those convenient vegetable oil sprays. Distribute the muffin dough equally among the cups. Bake until muffins are golden brown, about 25 to 30 minutes. Test with a long toothpick (we use a thin bamboo skewer) to make sure the center of the muffins are done. Set on wire rack to cool for 5 minutes. Remove muffins from the tin and serve slightly warm. I don’t know what else you expected.